The meal we be sausage beans & rice with may be corn bread. Dinner at 1800 hours. An important note, June begins a new club year. As such, dues need to be paid this month to stay current. Please see Grady or any other club officer to pay your dues. This Wednesday night 4/9/18 our Master Chef will entice us with a good ol’ Texas BBQ. Brisket of only the finest type will be used in this secret recipe. Dinner includes all the fixin’s you can think of plus a special potato salad that is sure to convert any potato haters (if there are any). Come early and watch planes crash! Seating is limited. First come first serve. Live music by Bands Unlimited had to cancel so no live music this week. Don’t forget to tip your waiter. So come on out, bring $5 and have the best time you can possibly have on a Wednesday night. This is Mark and I approved this message. January 27th will be our meeting for this month. Meeting at 9:00 AM. Come and meet and fly. 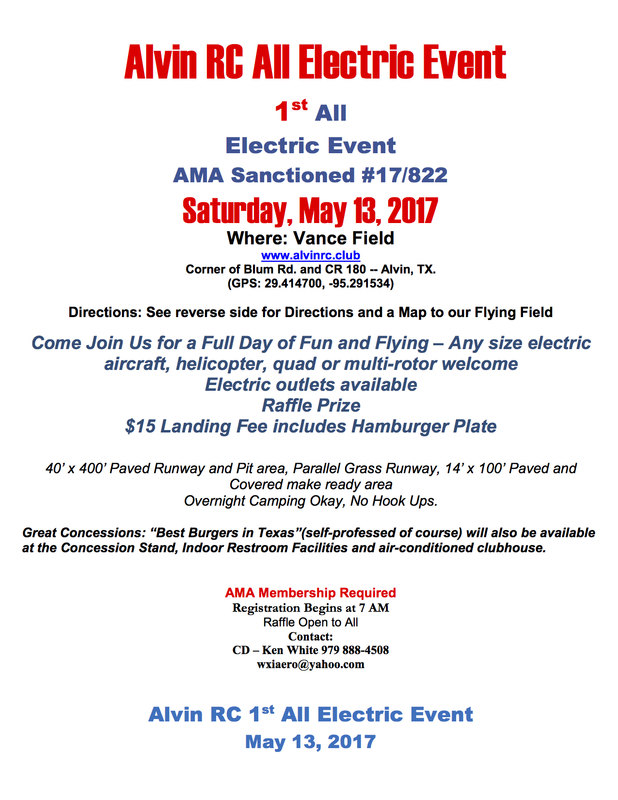 On December 2, 2017 Alvin RC will be hosting a Charity Fun Fly at our field in Alvin, TX. The attached flyer provides detailed information on our current plans for the event. All net proceeds will be used to purchase $25 gift cards. Being near Christmas the Gift cards will be given to the Sheriff of Brazoria County for distribution to less fortunate folks through the Deputies as they feel appropriate. Silent auction of many items will be held – donation of auction items from businesses and individuals are welcome. Just a couple of items for the club. First, we will have a work party next Saturday September 30 to finish cleaning up from Harvey. There are several boxes of papers and pictures that will be saved or thrown away, so please show up. Also, the October meeting will include nominations of officers and directors. Any one nominated must be given advance notice and should have agreed to serve. Finally, do not forget to come out October 14 to help with the Boy Scout event. Let’s help make sure they all get the merit badge. Looks like a good week to fly, see you at the field. Come Fly and Eat. Dinner at 6:00 PM. Fly Anytime. Brisket will be the main course. Yay! Join us for our 1st All electric event. Saturday May 15th at Vance Field. 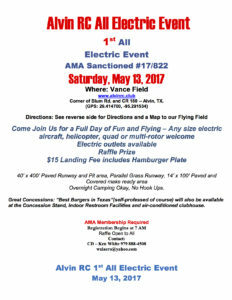 Come join us for a Full Day of Fun & Flying – Any size electric aircraft, helicopter, quad or multi-router welcome. Electric outlets available. Raffle prize will be a FMS Red Edge 540.